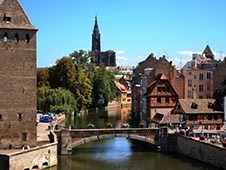 Strasbourg is located in north-eastern France. The city is situated on the Rhine River near the borders of Germany. In Strasbourg, you can hear conversations in German, have a glass of delicious beer, and visit the French cafe, etc. – the city known for its internationality. For many people, the city of Strasbourg immediately evokes associations with a variety of human rights institutions – the European Court, the European Parliament and the Council of Europe have placed their offices here. Even without the well-known organizations there is something to look at – visit Alsatian Museum, canals so-called "little France", the old town, admire the peaks of Notre Dame, to visit the botanical gardens and numerous art galleries. RIDING possible through the service Car rental at the airport Strasbourg – book a vehicle for yourself, please visit bookingcar.ru. Inspectors traffic police can impose fines on the spot, if the driver violated traffic rules. The police have to give the offender a special receipt in case of violation. In Strasbourg for parking vehicles can be taken to the penalty parking (by the owner). Park for more than 24 hours is prohibited. Buy a special card for parking-machines can be in tobacco shops that have a license for the implementation of the product (marked with red marks). Time and cost of parking on the machine. If you break the parking rules, police can seize the vehicle or the owner fined 17 euros. In Strasbourg, the maximum allowable norm of alcohol for drivers is the level of 0.5 ppm. This figure is considered to be average among the majority of the world states. Each driver must be in possession of a disposable breathalyzer. In the case of testing the alcohol level police and detect invalid number, the driver waits for a penalty of a large fine. On the territory of Strasbourg are a large number of petrol stations and shortage of fuel there. The fuel used is diesel, several types of unleaded petrol and gas (LPG). For France is characterized by low cost of filling of fuel in comparison with other countries.